So maybe your life isn’t going as planned, not even close! And maybe you’re beyond bothered, having tried so hard to do all the “right” things. I get you. There’s a edge here, an urge to make make some sort of grand gesture akin smacking all the chess pieces off the board and starting over. I wouldn’t. Not today, at least. We’ve got the reversed Hanged Man (or here, the Hanging Man) from my new deck, The Gilded Tarot. He’s not on the traditional tree, and strikes me as being more active than most versions we see, but at the very least, he doesn’t seem anxious or upset despite his predicament. And like most versions, his legs form a “4” shape, which I associate with Tarot fours, meaning stability and safety. Connected to Neptune, the Hanged Man often speaks to concepts like faith and sacrifice. His energy is very hard to pin down, and reversed, even more so. Think back to the challenging times you’ve had in the past, those points where you felt lost and frustrated. Some may have been extremely unpleasant, but did you not manage to find your way out? Did you not manage to grow in the process? Did you not learn lessons that could not have been learned any other way? Mercury is going direct and motion, hence leaving you feel less blocked shortly. In the meantime, grow your faith and accept where you are now in order to ride the energy in a natural progression. Follow Dixie and the Everyday Tarot on Twitter, Facebook, or YouTube. Or get help moving forward with a Tarot session. We’ve got the Hanged Man (Neptune), just there, fully in the moment without consternation or agitation. He’s eternally patient. Much like the High Priestess, the Hanged Man is not an superficially active guy. As advice, he says, “Do nothing.” As a forecast, he says, “It comes.” He waits, he allows, and he integrates. He does not struggle. He accepts and therefore maintains a sense of peace as a result of transcendence. We are not writing the script, nor are we in control, much as we may pretend otherwise. Surrender and sacrifice are the Hanged Man’s strongest plays. I realize that is sometimes challenging advice. This isn’t as passive as it sounds, though. Neptune energy is slippery—I’ll give you that! But in accessing this ethereal vibe, you earn you TRANSCENDENCE. You get REBORN. There is a melding between DREAMS and REALITY. The Hanged Man always gives me a bit of relief, because I know his overriding message is some variant of a reassurance. All is as it should be. Wait and see. Are you feeling the Hanged Man? What’s your story? What movie are you starring in? Does your script need a rewrite? If you alter lines will it change the outcome? 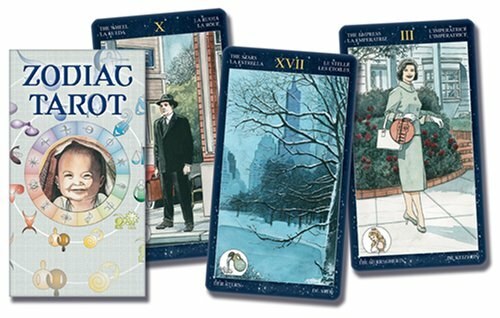 The Zodiac Tarot has such an interesting, astro-only take on the cards. Today, we’ve got the Hanged Man, associated with Neptune. Here, it’s shown as the movie theater, where the drama is playing out on screen and all the attendees are voluntarily immersing themselves into the story. It’s NOT about what’s going on in your life. It’s all about the story you tell yourself about what’s going on in your life. EVERYTHING is perspective! Got that? Everything. Is. Perspective. If you don’t like it, rewrite your own script—that’s the only one you’ve got editorial control over, y’know? And if you cannot immediately impact outer circumstances that you don’t like, fair enough. Adjust your inner dialogue, and the whole tenor of the movie will change. It’s akin to changing your life’s background score. It impacts the subjective experience more than you’d ever guess. Yes. It is that simple. Take faith, friends, and apply it to the task at hand. Does your movie need some rewrites?